*This is Part 4 of a series. 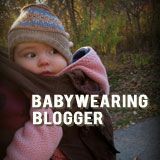 As I mentioned in the Introduction, it was Steffany's post in the Natural Parents Network that really got me thinking about babywearing positions and safety. You see, what I picked up from that post was that babies - even newborns - should be in a legs out, spread squat position. I had been babywearing E as a newborn and while we were in a tummy to tummy position, his legs were "froggied" inside the carrier. When NPN post came out, E just turned 2 months but since he was already a big baby (he was 6.7 kilos at his 2-month check-up), I was able to easily transition him into a legs out position and have been wearing him in that position since then. To answer your question, the baby does not spread the width of your body when they are in the natural spread squat position. The term "spread squat" refers to the natural spread of the legs that would mimic how far the baby naturally spreads their legs when they pull them up naturally with a diaper change or while they are in arms. The width of the spread will not be determined by your body, rather by theirs, and it will look different as they age and grow, and also will vary from baby to baby as well. The spread of the legs is accompanied by the bottom being lower than the knees, which is also a necessary component for the spread squat positioning. You can see in this video how a 3.5 month old baby is positioned. The legs are not spreading the wearer, but a natural spread squat position is obtained. You can also see in this video how the same position is obtained with a newborn with a much narrower spread, yet it is still the natural spread squat position. I have also done more research and the French wrap maker je porte mon bebe has this FAQ on how to prevent baby's legs from being over spread or forced into a squat. My next question to Steffany was whether it was physically feasible for a small baby to have the legs out position in a carrier. 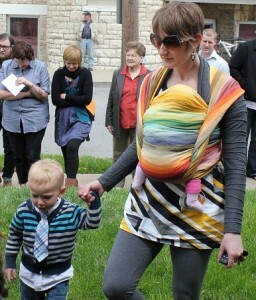 Steffany sent me this photo of her wearing her 3-week old baby in a wrap. The video here shows how to put a 1.5 month old baby in a sling with the legs out position. The pictures in this link also show how small babies can be positioned with legs out. Finally, this link talks about babywearing a premature baby and the picture shows the small baby in a wrap with the legs out position. Even for small babies, the legs out position is highly recommended. I have pasted below the reply of Beate Frome of the Babywearing Institute to my question on whether you can feasibly carry a small baby with legs out position. Beate's book is very informative and I would recommend it to parents who are still shopping for carriers. Meanwhile, you can also watch videos of small babies with legs out position in the je porte mon bebe website - although the site sells wraps, Pat of Wear and Nurse Baby, has successfully used the videos to carry her small baby, legs out in a ring sling. It is important to remember however, that for really small babies, the legs out position may not be possible. 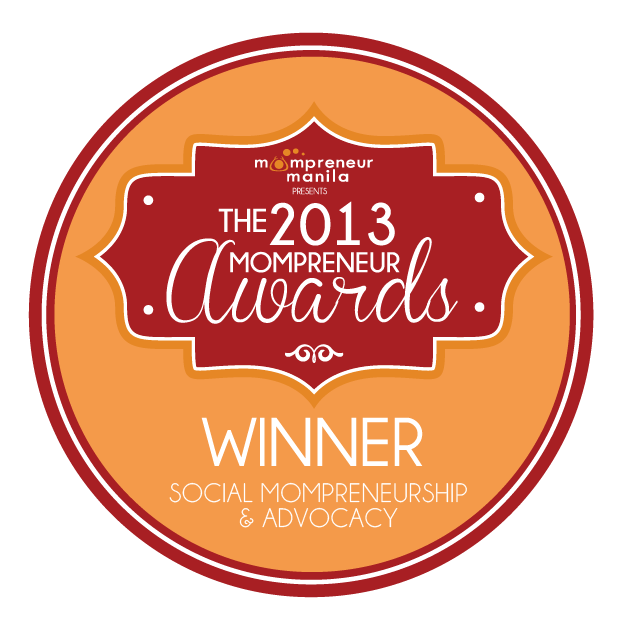 I clarified the comment of the Babywearing Institute above with Hosanna Camacho, PT. She mentioned that newborns are normally not placed in carriers frequently due to mother's recovery time and baby's limited activities (sleeping). She further explains the physiological flexion of newborns, whereby they are still all rolled up with tight miuscles and ligaments. As such, she believes that it is okay for newborns to be in the froggy position, but NOT FORCING legs into the froggy position. Finally, she notes that there are also a lot of factors to be considered such as the size of the baby, size of the mother, in determining whether a newborn can be in the legs out or legs in position. As the Babywearing Institute emphasizes, the safe position to be worn is the squatting straddle position (wrongly called the frog leg position) - see photo. Research has show how important the slightly tilted position of the pelvic floor for the hip is. If the legs are inside, the spine bears some of the jolts that would otherwise be absorbed by the squatting straddle position of the legs and knees. Baby can also not be actively involved in stabilizing him or herself which gives the baby a sense of loss of control. If baby is still all rolled up, try massaging and stretching baby's legs at least every time you change your baby. With legs in, the babywearer should not be moving around much but rather sitting down with the baby in the carrier. The spread-squatting position is the best for baby's hip development, hence a cradle position is not recommended, even for tiny babies. Hence, if you must carry your newborn inside the baby carrier, the squatting straddle or the spread squat position is recommended - which is usually done legs out. But do not force your baby to do the legs out position. Instead, if you do wear your baby legs in, try not to move around too much to prevent jolting of your newborn's spine. Do not use your baby carrier as a car seat. Use carriers that are appropriate for your baby’s weight and age. Some carriers are made to support older babies. Do not use them for newborns. Carry your baby in positions that are appropriate for their age. For instance, for newborns, tummy to tummy carry is recommended and not hip carry. Do not use your carrier while cooking as this will subject baby to an increased risk of burns. Don’t also use the carrier when doing activities requiring protective gear. Inspect your carrier to ensure that it is safe to use – check the fabric, seams, buckles, rings. Practice, practice, practice. 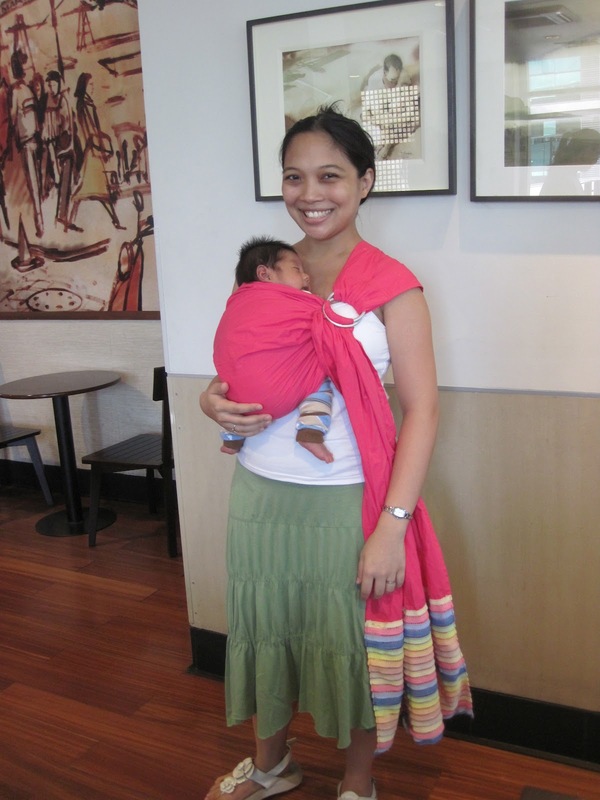 Babywearing is fun and easy but just like breastfeeding, it is a learned skill. Practice with a doll and practice in front of a mirror. Use a carrier that has a seat fabric that can be spread from one hollow of baby’s knee to the other, to enable baby to obtain the proper positioning. When using carriers in public, remember that your baby can reach. Don’t forget to protect your baby from the elements either. Carrier must fit the wearer properly. Particularly for sized carriers, do not attempt to share a carrier with your husband if your sizes are far apart. Safety of your baby is more important than money savings. Questions? Concerns? Leave a message! Love your site! I practice attachment parenting, I also have a blog I just started and have shared my thoughts on the TIMES magazine article Are you Mom Enough? 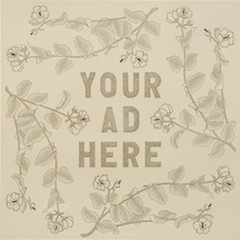 Please stop by to hear my thoughts! I really like your blog, I seem to learn new thing every time I visit your site. Babywearing Safely - Front Facing, Front Carry?